After committing to a pescatarian diet all week (Monday - Friday), I was ready for some meat! Even better is that I could enjoy some beef since my husband is out for the day (and he's not a beef eater.) 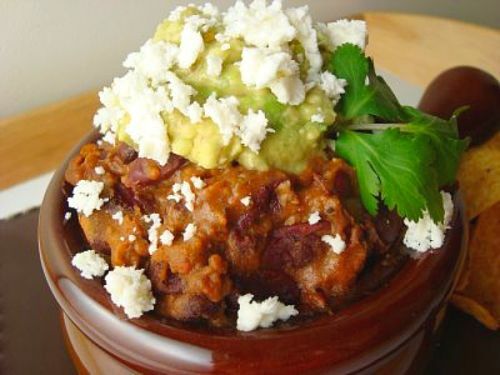 With Superbowl food ideas in mind, what could be better than some Chili con Carne? I found the following recipe on Food Network.com and chose it based on its ratings. I halved the original recipe and adapted it by using only beef stew meat (instead of both beef and pork), used canola oil (instead of corn oil), beef broth (instead of chicken) and red kidney beans (instead of pinto beans). This was hearty, chunky and flavorful chili with a nice kick from the chili powder. If you prefer more of a wet chili, you can increase the amount of broth. Discard all but 2 tablespoons of oil from the pan. Saute the onions over medium heat for 10 minutes, scraping up the browned bits with a wooden spoon from the bottom of the pan. Add the garlic and saute for 2 minutes more. Stir in the chili powder, cumin, and oregano and cook for 2 minutes. Add the canned diced tomatoes and whisk in 2 cups of the stock. Add the meat and any accumulated juices back to the pot. Bring to a gentle simmer. Season the chili with the salt and pepper, cover, and cook for 30 minutes. In a food processor or blender puree half of the beans with the remaining 1 cup of stock. Add the bean mixture to the chili along with the whole beans. Let simmer, uncovered, 1 hour more or until the meat is tender. Season with salt and pepper, to taste. I served this topped with homemade guacamole, crumbled queso fresco and tortilla chips. Oh that looks so good. Love the bowl too. that sounds sooo good. I love the presentation! This looks fabulous. I adore all things chili. I love how you laid out the photo. Very creative! I love that cute pot too.